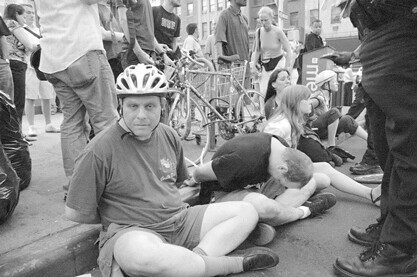 bicyclist arrested at July Critical Mass, originally uploaded by Green Biker. the latest article form the one local rag dedicated to the investigative reporting on the biggest civil rights attack since Selma Alabama. On Tues., July 26, the parks advocacy organization Parks 1 sponsored a mayoral candidates forum at New York University’s Skirball Center. The forum’s intent was to give candidates an opportunity to show their support for the city’s greenswards and, hopefully, pledge that, if elected, they would devote 1 percent of the city’s budget to park maintenance. Coinciding with the forum and to call attention to making parks a safer haven for pedestrians and bicyclists, Time’s Up!, the East Village-based bicycle advocacy group, organized a group ride through Midtown and down to the forum. As bicycles filled LaGuardia Place, several riders did a “bike lift” over their heads in a sign of rider solidarity and in tribute to cyclists who have succumbed to the hazardous operation of motor vehicles on city streets. Brooklyn cyclist Holly Mendenhall observed, “There have been too many cyclists killed in the past few months.” So far this year, 10 bicyclists have been killed in collisions with motor vehicles — neary twice as many as last year — two of those on E. Houston St.
A half hour into the forum, Erik Engquist, Crain’s New York government and politics reporter, opened his bicycle question on a personal note when he spoke of a friend who was killed in Prospect Park while riding a bike. What made the tragedy even more difficult, he said, was that the speeding van was in the park at a time when all motor vehicles were prohibited. “Would you be in favor of a flat prohibition on motor vehicles, cars and vans, in the park?” he asked the candidates. C. Virginia Fields, the Manhattan borough president, offered a tentative suggestion of balance between cars and other uses. “I would prefer looking to see how we can do that as opposed to outright prohibition,” was her answer, which was met with polite applause. Just three days later, the monthly Critical Mass bike ride saw 34 riders arrested, the largest number since March’s 37 arrests. Since last year’s Republican Convention, police have chased and blocked the rides in an attempt to end the monthly events. However, the past few months saw tensions lessen, as fewer riders participated, policed by fewer officers. The reduced tensions might have been why several hundred riders gathered in Union Square Park last Friday, where a speech by public advocate candidate Norman Siegel, a satiric rap performance by a member of Billionaires for Bush and words of encouragement from a Portland bike activist preceded the ride. At earlier gatherings, police had handed out fliers warning cyclists that joining the ride was a violation of the law. In a counterpoint, FreeWheels, a group formed to offer financial assistance to arrested riders, passed out an “Important Notice To Cyclists.” In a format intended to mimic the police flier, FreeWheels outlined traffic laws that grant cyclists the right to ride the city’s streets. The ride started just after 7:30 with cyclists stopping for red lights as they left the park, heading west on 14th St. Soon the ride splintered into smaller groups, with some heading north on Eighth Ave., while others continued on to Hudson St. and then south. At 8 p.m., as a small group approached Seventh Ave. on 14th St., police blocked off the intersection and started placing riders under arrest. Among them was Lower East Side resident Sharon Blythe, who is five months pregnant. She was noticably upset as a police sergeant led her, handcuffed behind her back, from the curb and into a waiting police truck. Sitting by the door, she cried out to a reporter, “I was standing on the corner. [An officer] tackled me after I told him I was pregnant. I’m stressing out; they made my handcuffs really tight.” Her boyfriend stood nearby, talking with police until they allowed him to approach the truck and offer her some water. Blythe said the group she was riding with was very small and stopped at every red light. “The people who obeyed the law are the ones they arrested,” she said. Because of her pregnancy, Blythe went to the hospital after her release on Saturday for a checkup and was found to be in good health. Ten blocks south, another mass arrest was underway. About 50 cyclists had continued down Seventh Ave., with a dozen police motor scooters and other police vehicles following closely behind. Christopher Ryan, a filmaker, musician and host of “Team Spider TV,” a music and bike-oriented show on Channel 57 Wednesday nights, was among those 50 riders. “Everyone was dutifully making the stops at every light,” he observed, noting no traffic laws were broken. “When we stopped at the red light, they [police] formed a wall of scooters inside the pedestrian crosswalk.” The scooters had circled the newsstand at Sheridan Square and pulled in front of the riders, blocking their progress on Seventh Ave. South. “Then they started to arrest people,” he added. Fifteen riders were arrested at this location. At about the same time, Kristin Steinbach was pedaling on Sixth Ave. near Ninth St. Steinbach, who teaches high school history and sometimes uses her bicycle to commute to work from her Upper West Side home, was riding with about 40 other cyclists when, “All of a sudden a cop car came and swerved into all these riders and I’d say they came close to probably hitting about four other riders.” She was arrested with three others. Arrests were also reported at 23rd St. and Eighth Ave. and 33rd St. and Second Ave. The Police Department did not respond to a request for comment by press time. All of those arrested were released by 4 a.m. the next morning, except for one who was held over for an outstanding warrant. As in past rides, charges included disorderly conduct, parading without a permit and riding in a procession. As riders left the Seventh Precinct on Pitt St., they were met by Blue Young and other members of FreeWheels, who offered replacement bikes for the ride home. Attorney Gideon Oliver, a lawyer who represents numerous Critical Mass clients, was also present to offer legal advice to the exhausted cyclists. Too harsh on the mass ride? Court date and Cyclist Killed.